If you just buy one new piece of makeup next month, make it one of the new limited edition eye crayons from Smashbox. These creamy sticks of stay-put colour are absolute genius - over the past few weeks, they've been the most-reached for piece of makeup in my kit. 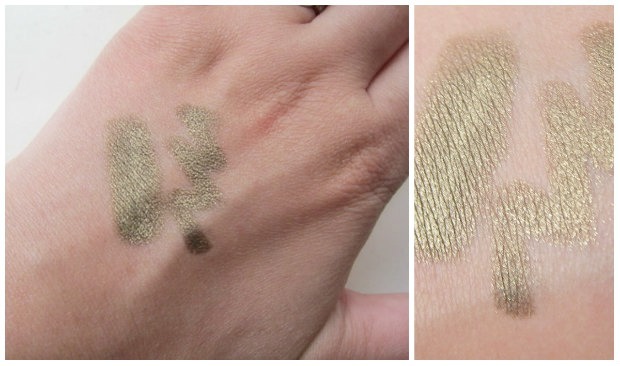 Super smudgy and totally foolproof to apply, these babies are your ticket to an easy peasy, one step smoky eye. Launching on August 21st for €19, the two shades temporarily joining the regular line-up (which you can check out here) are Blackest Black and Black Gold, and it's the latter that I'm showing to you today. This rich metallic khaki / antique gold will flatter every eye colour, work for any occasion and provide soft and wearable definition that lasts all day. Perfect for applying on the go, the creamy waterproof formula glides on with no pulling or dragging and can be blended out with the attached smudger, your fingers or a brush. You have a bit of time to work with it but when it sets, it stays put all day with no flaking - a godsend in the warmer weather, when everything else I own seems to slide down my face within minutes. I'm completely smitten with the colour, the convenience, the formula and the ease-of-use - the only bit I don't like is it's limited edition status, which means I'll be panic-buying back-ups before it disappears. What do you think, are you feeling it too? Check out the full Fade to Black collection. You've totally sold this to me Emma, I love the way it looks on you. Roll on Aug 21st! Have even put an alert in my phone to remind me!! ok, that is so fun. That's a beautiful shade with your eye colour Emma, really suits you! :-D I love the look of these must check them out. I reviewed the Rimmel version of this on my blog today but I don't think they have such nice colours. I can't wait to get my hand on this, the colour looks class. It is very pretty and looks wonderful on you. Oh gosh! It stay's put? I need that in my life! Beautiful gold! I love it! So pretty on you! I will have to watch out for this one! LOVE this shade Emma, looks so pretty on you! Don't you hate when you find a product you love and it's Limited edition! It looks amazing on you Emma! I love the color and will have to look into picking this beauty up. Emma you got the sexiest look using this product! Unfortunately I'm a mess at applying sticks/big crayons. Gorgeous and it suits you beautifully, I need one now! Saw this on Karen too - so stunning!